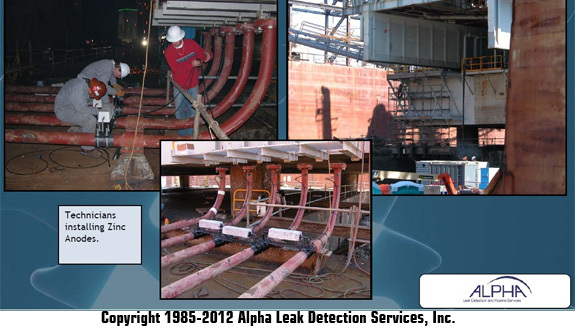 Anode Assemblies - Alpha Pipeline Integrity Services, Inc.
Home » Anode Assemblies - Alpha Pipeline Integrity Services, Inc.
Anode assemblies will further the life expectancy as well as produce a higher output of mitigation to A/C mitigation units. Alpha offers a variety of materials and/or installation options as defined by the project specifications during engineering and design. Many options are available for A/C Mitigation including: high silicon cast iron, zinc, and copper. Anode assemblies for cathodic protection are also defined by engineering and design and can be comprised of aluminum, MMO – mixed metal oxide, high silicon cast iron, or magnesium. Each material has advantages and disadvantages. The design and choice of anodes for a cathodic protection system should consider many factors, including the type of structure, the resistivity of the electrolyte (soil or water) it will operate in, the type of coating and the service life. We can work with your designs or provide them to ensure specifications meet NACE and DOT standards.